In a recent article for America, Colleen Dulle asked, “Where are the millennial Catholic activists?” The question was prompted by the arrest on Feb. 27 of 40 Catholic leaders who had gathered in the U.S. Senate building to demand action to protect Dreamers, the undocumented immigrants who were brought to this country as children. She noted that those who were arrested were overwhelmingly older people, and made the case for greater millennial engagement in Catholic social justice movements. It is true that most of the people getting arrested were of the Boomer generation, many of them older Catholic sisters. What Ms. Dulle overlooked, however, is the number of millennial Catholics who also showed up that day in support of Dreamers. They were not on the front lines getting arrested. They were not in the photographs that made headlines following the event. But they were there. I know because I was one of them. Millennial Catholics were not on the front lines getting arrested. But they were there. I know because I was one of them. Last May, I graduated from the College of the Holy Cross with majors in religious studies and French. During my time there, my faith led me to question the status quo and challenge unjust structures. My passion for religion and justice carried me to Washington, D.C., after graduation to work at NETWORK Lobby for Catholic Social Justice as a communications associate. Since starting at NETWORK, I have been impressed by the role the faith leaders can play in shaping politics. But even more so, I am continually inspired by the other young Catholics I meet who are working for justice. Sister Simone Campbell, of “Nuns on the Bus” fame, may be the face of our organization, but behind her is a staff—including many Catholic millennials—who make our work possible. 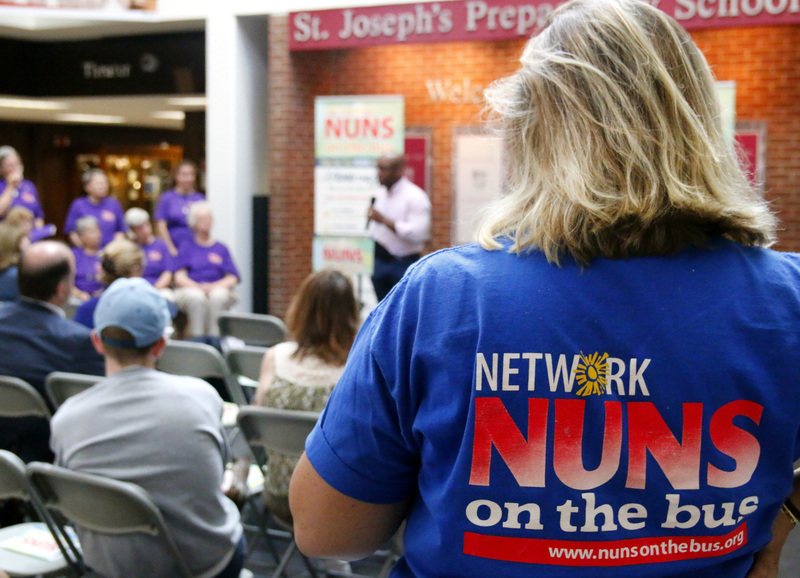 NETWORK’s staff is not an isolated example of young Catholic activists. The same can be said of many of our coalition partners. The Ignatian Family Teach-In, which brings together thousands of high school and college students each November for social justice workshops and advocacy, is an amazing testimony to the power of young Catholics to mobilize and take action. There is a pipeline of Catholic activists cultivated by groups like the Ignatian Solidarity Network, Jesuit Volunteer Corps, Mercy Volunteer Corps and NETWORK who go on to work for justice in other fields, from law and politics to teaching and community organizing. Millennial Catholics are still showing up for justice. If the face of Catholic activism today is the Baby Boomers, then millennial Catholics are certainly the body. While we may not always participate in acts of civil disobedience, we are showing up at rallies, protests and marches. We are the ones organizing events, tweeting, taking pictures and participating in the collective call on Congress to do more. And for millennials at the start of their careers, this makes sense: Who knows what an arrest record could mean for pending law school applications or other career moves as we discern and live out our vocations? Even though our actions do not appear to be as “newsworthy” as those of our elders, without us these movements would not have the traction they do, especially in the modern media environment. Maybe the problem is not the decline in millennial Catholic activists but the decline in millennial Catholics period. Regardless, millennial Catholics are still showing up for justice. Enlivened by our faith to work for those living on the margins and in the shadows, we will continue to do our part and make our voices heard. It would be an interesting question to discuss just what is justice. Socrates had a difficult time doing so. One thing liberals never want to talk about is that their social policies enacted over 50 years and still operating today have caused a large percentage of the population to start from a much poorer starting position. Discussing these policies are anathema on the America site and in America the magazine. Nothing in your comment gives evidence to your final statement which is not true but pure unfounded opinion. Western Europeans have some of the best living conditions in the world because they, better than even us, in the U.S., have very liberal governments. Nothing in your comment gives evidence to your final statement which is not true but pure unfounded opinion. There is plenty of evidence. For example, children born without both parents in the black community was about 6% in the early 1930's about the same as white Americans. By the early to mid 60's it was between 25% and 30%. By the 1990's it was over 70%. In some inner cities it approaches 90%. Guess what caused it? Guess what are some of the effects of this? I have no idea why you brought up Western Europe. But I have something for you to read "The Strange Death of Europe" by Douglas Murray. I have been all over Europe and it is very nice. Europe often comes across as a giant theme park based on history and it is lots of fun to visit and poke around. But my impression was they have a lower standard of living than the United States but most live well enough because they have lower expenses. Fewer children and virtually no military to support. What they also do not have is the great mixture of ethnic groups that commingle as in the United States. But where there are these comminglings in Europe, they are having major problems. Unless there are major changes, Europe as we know it will not exist in 50 years My guess is as major changes are forced on them by circumstances caused by their current behavior they will change course and try to revive their past culture to accomplish great things again. Right now too many of them are just living out their lives in pleasure. And so are a lot of Americans. Hard times create strong people. Strong people create good times. Good times create weak people. Again opinion not facts. Europeans have better health care, job benefits and time off and are better educated than us. Yes partly this is because they don't start wars over oil that only benefit the rich who don't fight in them. So your idea Is to go make ourselves miserable in the hopes it will make us happy. No thanks. This article is about justice and then you trot out Europe. Now you trot out oil. I fail to see how anything you say is relevant. You claim you want facts. But all you give are opinions which are wrong and then criticize others. Again opinion not facts. Europeans have better health care, job benefits and time off and are better educated than us. Europe is not having children which makes their disposable income used mainly for pleasure. The United States is about to become the largest producer of oil in the world so why should it be making wars over oil. Lower oil and gas prices benefit the poor most of all. Please, the article was about social justice and then you provide a lot of ill formed irrelevant opinions in response. As I understand the original theme of this article, the author wishes to assure the reader that millennials are as engaged in activities that tend to promote the general ideals of Catholic Christianity as are the boomers. Personally, based on intent observation, I am assured. I would suggest, however, that some clarity could be added to these observations if we could distinguish between activism and action. I think that many generational cohorts, not only the two contrasted in the article, have engaged, in their own way, in the promotion of the general ideals of Catholic Christianity. After WWII, for example, beginning in Europe but migrating soon enough to the U.S., Canada, and parts of our southern hemisphere, there was Catholic Action, which drew its inspiration, as I recall, from a papal encyclical, the name of which I can’t remember. Catholic Action was expressed in many forms, quite a few of them being on the quiet side, involving person-to-person interaction. A big part of Catholic Action, as well, was the emphasis on personal virtue. And an important aspect of that emphasis was the reawakening to the ancient and honorable idea of social justice as a component of the moral virtue of justice, a much richer concept than the transactional version that seems to be the the object of much derision. My point is that "social justice" is a sham because it is so vague and can mean anything. And often what is called social justice leads to some horrendous outcomes. Certainly a Catholic should want what is just and fair. The question is what is just and fair? It is not so easy to define what justice is let alone determine if a specific situation meets the definition. We have on another thread someone who identifies as an ultra social justice person mandating the acceptance of the killing of children. Sexism is both a grave sin and severe social injustice which our church breeds into itself and the societies around it with extremely negative results on a global scale. Maybe millennials are not willing to pretend Religion and especially Roman Catholicism are not the problem anymore. Our sexist ordination practices cause poverty, sexual violence, child abuse simply by teaching that women are less sacred than men. We teach this everyday, around the world, in every church, that won't allow an ordained woman the priesthood they were called to by God and the right to preside over Holy Eucharist like their brothers. Unequal ordination leads to unequal education of girls and women and the degradation of our Sisters in Christ. Yet we good Catholics stand by and hold signs against the multitude of social ills which are mere symptoms of the disease we fully participate in promulgating within our societies. Trump had many Catholic voters and our bishops didn't start opposing him or his policies until after they helped get him elected. I believe that women should be eligible for the priesthood, but I believe your list of the evils caused by their exclusion is erroneous, the harm done vastly overstated. It does not help a cause to offer incredible arguments in its favor. I don't know who funds these lobbying groups, but I suppose it's a good thing in that they give jobs to people who decide to spend their (or usually their parents') college dollars on otherwise valueless majors. Is it my taxes and church donations that are being redirected there? Imagine if these kids majored in subjects that add actual value to society, formed families and served as examples of self-sufficiency instead of promoting a culture of whining for entitlements? My name is Kyle, and I’m a millennial like the author, Ms. Cunningham. I would be happy to have my church donations contribute to an organization like NETWORK. You can see at their website (networklobby.org) an outline of the issues they lobby. These issues aim primarily at what you value: adding value to society, promoting healthy families, and making it possible for the poor to have the dignity of self-sufficiency. I intend to make a donation to them today in your honor. I am also a recent graduate of an expensive, Catholic University, and I majored in what would be called a “useless” liberal arts degree. My parents made this education possible, for which I am very grateful, but I share that burden in the loans I am working to pay off. I know that I whine just as much as anyone. Often I let it be an obstacle to myself and my work. Yet Ms. Cunningham is not whining; she writes in her article that her education led her to recognize how many people had obstacles preventing them from living with dignity. My own education taught me to question whether I should pursue my own benefit, or, like Ms. Cunningham, fight for others to have strong, supportive communities and families. I think such an education is of immense value in a world with as much suffering as our own. Thanks for making a donation in my honor; I will withhold my next church donation and use it towards paying my daughter's tuition and obtaining her business degree. Hopefully she will create a company that will employ many people who need jobs and wish to become self-sufficient; at the worst, she will have a solid income of her own, enabling her to form and finance a family and not become a burden on society. There are many ways to contribute to the good of society besides making personal sacrifices or marching in the streets, although for some reason today's educators no longer teach that. While I might come off as insensitive and selfish, I've learned in my many years that I have done far more for the world with earning a lot of money than I could have ever done by working for some politically funded lobbying group and calling for people to scream in the streets. But I suppose it makes more sense to some people to direct their efforts at trying to solve the problems of the needy directly instead of focusing on bettering their own life first. When flying, there's a reason we are instructed to put on our own oxygen masks first before helping others in the plane. But it always sounds selfish when we hear it. In my day we used to say, "God helps those who help themselves," and there is a lot of wisdom in that. In lieu of reading up on Thomas Sowell’s “cosmic”…a random factor—beyond anyone’s control, one may find merit in reading “The Great Escape”, written by Nobel economist Angus Deaton. Mr. Deaton reviewed the last 250 years of governments and economies of countries around the world and their impact on outcomes. The author’s coworkers remind us of Pope John XXIII’s quote, “justice comes before charity”. Socrates never wrote anything. About 99% of what we know about what Socrates said was written by Plato. What you quote from Plato was his vision of an utopia which has never succeeded whenever tried. Another's person everyone should read is Victor Davis Hanson. Victor is one of the most insightful writers of the current world and a classicist who knows Plato well. I am not sure what the rest of what you wrote means. It just seems scattered statements. For example, why not read a lot of people. And I would definitely recommend Thomas Sowell as a must rather than not read him as you said. By all means read Angus Deaton. He reports on the amazing success of free market capitalism. Inequality is the engine that drives humans upwards. It is how God made us. Let's hear it for inequality, it's what motivates us to succeed.. Otherwise we would all be worker ants. Right now, Amazon and Walmart are fighting a final battle to see which company will become The Store. Amazon will probably win. At that point, competition will die. Unfettered capitalism has its own destructive devolution built in. Technological startups these days have in mind not the birth of new competition for the large corporations. They're goal is to become successful enough to be gobbled up by a megacorp in exchange for lots of kwatloos. You credit capitalism for all the "progress" made in recent human history. In reality, human understanding of the natural world reached a critical threshold, and took off by itself. It's the knowledge explosion that's driven the process, for better or worse. Capitalism just rode the wave. You are right in most of what you say but are missing some key things and seem to have a misunderstanding of a couple others. First "capitalism" can mean many things and to just use it without qualifications clouds issues. I use the term "free market capitalism" to limit activity to that which emphasizes freedom in exchanges. And exchanges means two or more parties. So all have to be essentially free for "free market capitalism" to work. If the buyer has only one real supplier or the supplier has only one buyer, then this is not free market capitalism. Most capitalism in the world is not of this type but usually started out as such. There are terms such as "state capitalism" and "crony capitalism" which describe something quite different. Jerry Muller of Catholic University has written books on this and has a Great Courses course on Capitalism which is more inclusive than his book. Niall Ferguson in his book titled "Civilization" described the six conditions that led to Western European/English North American dominance of the world economically. Basically they are 1) competition, 2) protection of property, 3) science, 4) modern medicine, 5) consumerism and 6) work ethic. All became part of English, Dutch and North America in the early 18th century. The rest of the world had some of these but no where close to all. Japan not knowing why the West was more successful, copied everything even the clothes worn by the West. Hirohito used to dress in a 3 piece suit. Google "The Killer Apps | Civilization: The West and the Rest with Niall - PBS"
Deirdre McCloskey has written several books on economics and what caused the explosion of economic activity in these regions I just pointed to. She adds another consideration. It became all right for the common person to succeed. What made us modern, and rich, was a change in ideology, or "rhetoric." First in little Holland and then in Britain a new dignity and liberty for the middle class freed innovation. A unique wave of gadgets, and then a tsunami, raised incomes from $3 a day to $30 a day and beyond. In her brilliant, engaging survey of what we thought we knew about the shocking enrichment since 1776, McCloskey shows that the usual materialist explanations don't work—coal, slavery, investment, foreign trade, surplus value, imperialism, division of labor, education, property rights, climate, genetics. Ranging from Adam Smith to the latest theories of economic growth, she details what went wrong with the routine explanations. The most important secular event since the domestication of plants and animals depended on more than routine. It arose from liberties around the North Sea achieved in the civil and anti-imperial wars from 1568 to 1688, and above all from a resulting revaluation of bourgeois life. So look to freedom as the explanation for modern success. The left is anti-freedom as they impose their forced equality themes and there is no real "right" anymore. It used to be hereditary hierarchy but that is gone except in Communist countries and other dictatorships. The real opposite of the liberal/left today is freedom. Crony Capitalism and State Capitalism are more left than freedom. Which is why Silicon Valley is now mostly aligned with liberals on political ideas. They have arrived and are a new ruling class and are not interested in freedom. The other term one hears a lot and is misused is "Laissez-faire " This sort of means anything goes and free market capitalism is often confused with it. But it has a survival of the strongest connotation and that may be what we are seeing with Amazon. Laissez-faire is not free market capitalism because the former can lead to lost of freedom in markets. So the main job of government is to ensure freedom and that means for everyone as best as it can. And that may mean limiting economic power developed through the free market when it starts to restrict freedom in exchanges. For example, people are already claiming that Amazon should be broken up. Their buying of Whole Foods caused a lot of concern. In fact today the news is about Trump possibly going after Amazon for anti-trust reasons. Your thesis of knowledge as the basis for the explosion is only a part of what was necessary. Not all but most of the knowledge arose where freedom became paramount. The rest of the world has the knowledge now but yet develops little of it. For example, China has stolen incredibly amounts of proprietary knowledge. What led to the knowledge explosion was the six characteristics that Ferguson listed plus the change in attitude towards who could participate in this activity emphasized by McCloskey. Being rich is not enough as the Muslims and Spanish were once incredibly rich but developed very little. Freedom and a rule of law are the essential elements along with an attitude for anyone to achieve. An anecdote told to us by our Dutch guide in Amsterdam illustrates this. Charles V from Spain was once the most powerful man in Europe and probably the world and the Netherlands were part of his empire and Catholic. He told the Dutch not to trade with the rest of the world because he wanted to control it. So the Dutch became Protestant and became much more powerful than the Spanish in world trade. Mr. Cosgrove, Plato’s justice works fine given neither extreme poverty nor, again, excessive wealth. Plato’s justice has an Achilles heel, excessive wealth. Historically, economies have had a nasty habit of defaulting to excessive wealth. The author, having been to Appalachia, perhaps could relate to Mr. Deaton’s insight on Appalachia and Bangladesh. Life expectancy in Bangladesh runs seven years less than the U.S. average. One of the author’s coworkers wrote a book, “A Nun on the Bus” which notes several popes have said, “justice comes before charity”. One commenter attributed to Adam Smith the following: low profits and high wages characterize healthy capitalism; low wages and high profits characterize crony capitalism. Mary Cunningham is a communications associate at NETWORK and a graduate of the College of the Holy Cross in Worcester, Mass.